Hanover, April 26, 2016. Following the successful launch last year, Semperit is introducing further additions to its new Runner tire family. The steer-axle tire, Runner F2 and the drive-axle tire, Runner D2 which are for use in combined regional and long-distance transportation are now available in the size 315/70 R 22.5. The high-mileage tires offer both a long service life and good fuel efficiency. The complete tire family, which includes the trailer-axle tire, Runner T2 will be on display for the first time at the Commercial Vehicle Show 2016 in Birmingham. Newly designed treads with a compact pattern (void optimised pattern) and specially developed rubber compounds make these tires the masters of mileage. "With the Runner family, Semperit is offering robust tires that reliably deliver good performance mile after mile. These tires will take you anywhere, from the freeway all the way to the mountains," explains Daniel Gainza, Marketing Director Truck Tires EMEA at Continental Reifen Deutschland GmbH, whose product portfolio also includes the Semperit brand. Thanks to intelligent sipe geometry, the Semperit Runner tires get the vehicle safely to its destination – even on rain-soaked road surfaces. The Runner D2 315/70 R 22.5 drive-axle tire is distinguished by both the M+S and Three Peak Mountain Snowflake (3PMSF) markings. The Runner F2 315/70 R 22.5 bears the M+S symbol. The steer-axle tire also offers a higher load rating, meeting the new requirements for Euro 6 vehicles. The reinforced bead allows both tires to effectively withstand varying loads and their improved wear behavior increases driving comfort. Semperit is showcasing the complete Runner tire family including trailer tires for the first time at the Commercial Vehicle Show in Birmingham. Of course, the new Semperit tire range is only really rounded off with a matching trailer tire. The Runner T2 385/65 R 22.5, which will be launched officially in the summer, is now on display for the first time at the Commercial Vehicle Show 2016 in Birmingham. Its wider tread delivers high mileage and the new composition of the rubber compound makes the trailer tire more resistant to cuts. 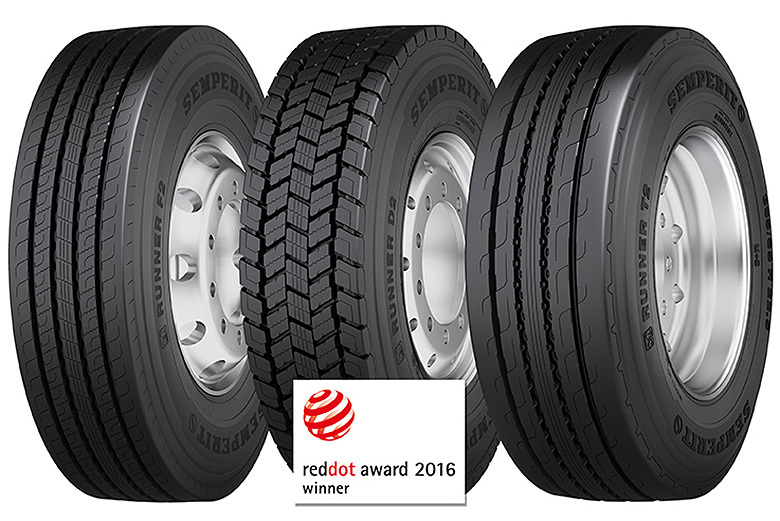 The outstanding design and high design quality of these Semperit tires is affirmed by the Red Dot Design Award 2016, which was awarded to the Runner D2 315/80 R 22.5 drive-axle tire. All the tires in the Semperit Runner family are regroovable and can be retreaded.